Latvia’s capital Riga has many reasons for priding itself as a city of culture and good looks: it has one of the best-preserved and most charming historic centres in Europe, with lots of majestic medieval buildings, cute romantic streets and alleyways, beautiful parks – in general an atmosphere made for visitors to fall in love with. All great reasons for enjoying the city, just like we did during our visit. Still, what really puts it aside from many other places is a district famous for its architecture: an architectural style that somehow, almost unintentionally, became synonymous with the Latvian capital. 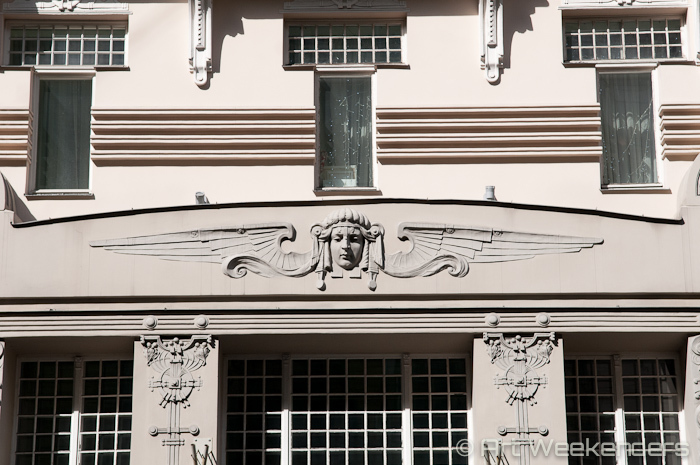 The neighbourhood we refer to is Riga’s Art Nouveau district, mainly concentrated around two thoroughfares: specifically the Alberta Street, a bit hidden from the general city buzz, and a stretch of the busier and way longer Elizabetes Street. 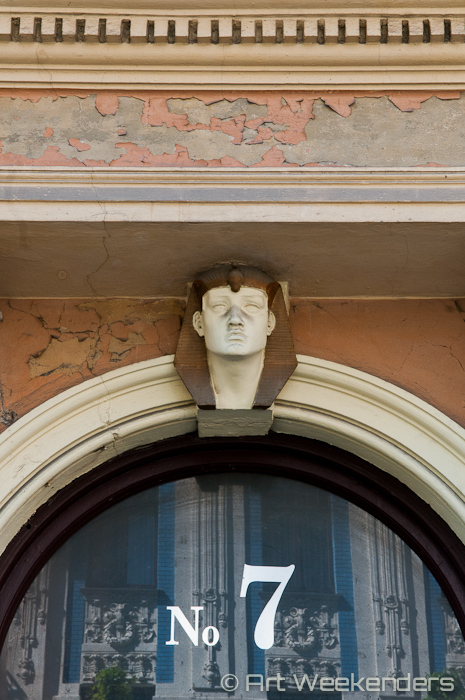 While these streets – thanks to the high concentration of extravagant buildings – are rightly the famous Art Nouveau spots of the city for tourists to flock to, Riga is in fact brimful of many other buildings from its glorious Art Nouveau era. Spread out across the city centre, and actually even further afield, at the latest count there are some 116 prime examples of Rigan Art Nouveau mansions to admire. It just happens that these buildings were in the hands of a certain Mikhail Eisenstein, an engineer who made a little bit extra out of his work – at the time not to everyone’s liking. Until quite recently this neighbourhood was a hidden surprise for many visitors who made it to the Latvian capital. Over the dark period of the Soviet era it wasn’t necessarily the highest priority to maintain these buildings, simply because there weren’t enough funds to do so. With no funds around, the buildings started to show the signs of time, with thick layers of pollution and decaying walls hiding what these mansions really should’ve looked like. People also had enough other concerns to care much about the looks of some buildings, and with no tourism to talk about there wasn’t anyone coming to have a look anyway. It’s all different now – and it was definitely different back over a century ago when they were first built. 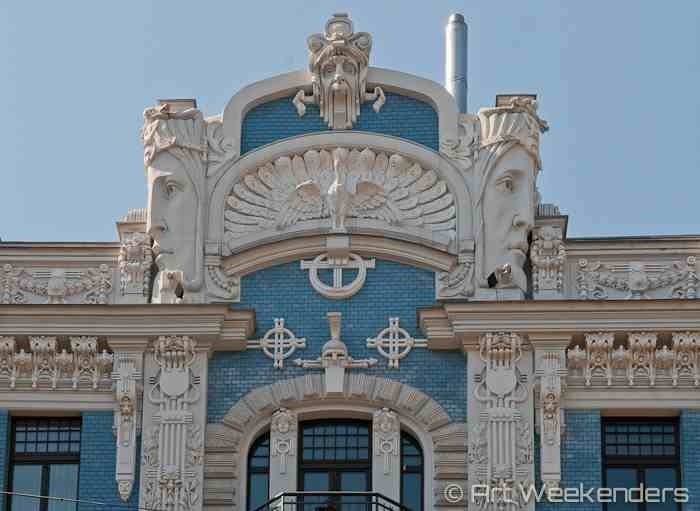 The Art Nouveau style swept across the world at the end of the 19th century and eventually reached Latvia too. 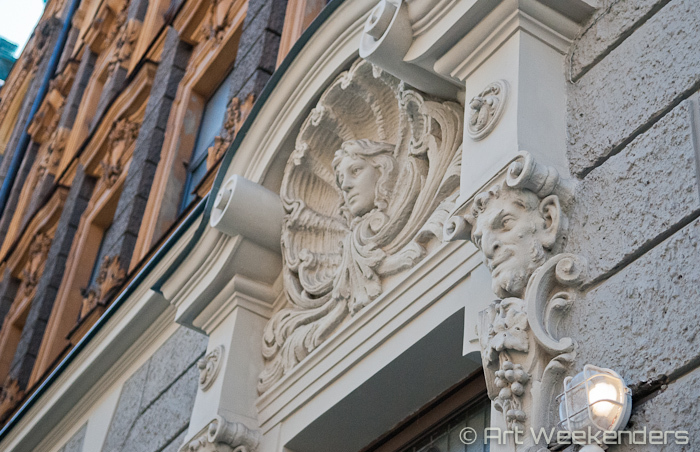 Today, following the path Art Nouveau in Riga left for history also helps to gain a deeper understanding of the city’s relatively recent history. While Riga ever since its medieval past maintained a status as a rich and influential Baltic city, it faced a completely unprecedented economic development around the turn of the century. Europe in general went through some of the most affluent decades in history and it’s no surprise that the boom spread across the Baltic Sea as well. 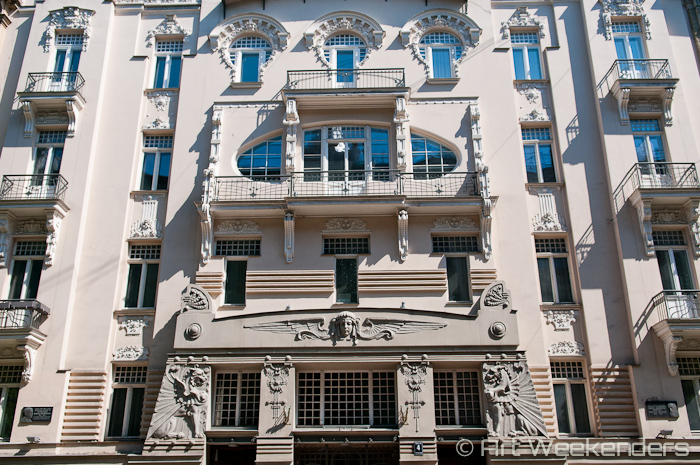 The economic wave from the continent brought with it not only a development in life quality, but also the fashionable trends from other parts of the continent, including this new architectural and design style with so many different names: Art Nouveau. It’s no coincidence that the style ended up with different names: almost simultaneously across the world it became an international symbol of a new awakening. If you really want to stretch your imagination, it could be said that Art Nouveau was the style that liberated the world from the stagnating styles of the past. This was the style that broke down the conventions of the day. While it might be a slight exaggeration comparing it with other styles that changed the course of history, like for instance the Renaissance, we believe nobody’s going to object if we say that thanks to Art Nouveau and the general societal movement of those years the world ended up on a new path, heading into the modern era as we know it. Until the 1880s – be it France or Victorian England, the Habsburg Austria or the rigidity of the southern European kingdoms, or even the United States across the Atlantic – art and life in general was dictated by strict rules and certain norms to follow. But just in the years prior to the 1880s, a new art movement grew out from the conventional norms in Paris, upsetting the rules dictated by ‘The Salon’: the impressionists. The ideas of looking at the surroundings with different eyes slowly started to gain in momentum, be it in art or otherwise. At the same time, thanks to the industrialism, the quality of life kept on increasing and suddenly more and more people got new opportunities in life. Art Nouveau was unlike any other style prior to it. It took its influences from nature, plants, shapes and curved lines. Artists working with the style made serious efforts to create a new form different from the established standards. The style started out in parallel in different locations around Europe and it got popularised mainly by the newly emerged style magazines that thanks to improved communications now easily could be taken from one city to the other. The actual name, ‘Art Nouveau’, only became a common terminology later on, initially catching on thanks to the Maison de l’Art Nouveau gallery in Paris, owned by the German art dealer Sigmund Bing. From Germany similar ideas started to be spread from Munich via the style magazine ‘Jugend‘ – meaning, youth(fulness). Not surprisingly, in the German world the style stuck to the Jugend name and in fact it still does today. In the Habsburg’s Austria-Hungary, thanks to some political scandals involving the heir to the throne, arts opened up and dared to confront the established norms, which is also confirmed by the name the style got in Vienna: Sezession (secession from the established norms). Just like in the neighbouring countries of Hungary, the Czech Republic and Slovakia, this name is still the one used for the Viennese Art Nouveau style. Going Westwards in Europe, in England the style’s name symbolised its affinity to the movement towards a practical way of life and it became synonymous with the arts and craft movement. Further north in Scotland an architect, designer and ‘liberator’ of the arts named Charles Rennie Mackintosh initiated what became known as the Glasgow-style. In southern Europe – just like in Russia – the name symbolised a more pragmatic approach: it was called the ‘Modern style‘, both in Italy and in Spain. In Barcelona really big things started to happen: the name of Antoni Gaudi might ring a bell, right? We could go on and on, country by country, different names, slightly distinct styles, but one common idea remained: changing the status quo. With this many different influences around, no wonder that once the style reached Riga in the mid 1890’s the field was free for interpretations. There was simply no certain norm to rigidly adhere to. At the same time as this cultural wind swept across the world, Riga’s financial boom also reached unprecedented heights. Life quality was steadily increasing and there was a new tier of a middle class eager to invest their money and show to the world that they had enough of it. With space in Riga becoming limited in the old centre the city experienced a sudden expansion, where new mansions and houses were built. A demand for new housing and a new style sweeping through the continent could only mean one thing: a happy marriage of the two. 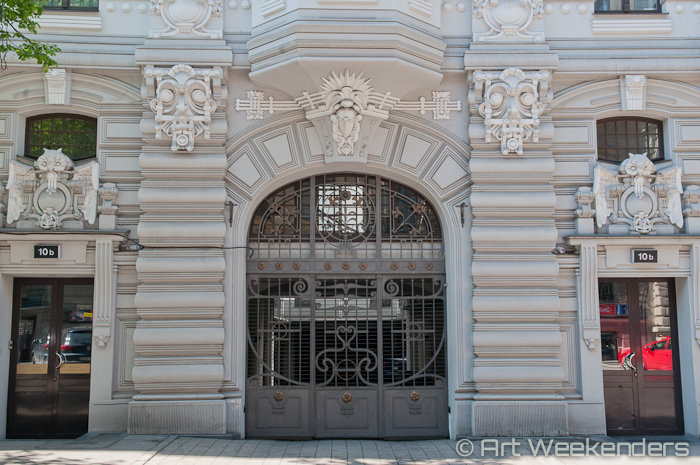 The architects active in Latvia’s capital at this time all got their education mainly in Saint Petersburg at the Institute of Civic Engineering and locally in Riga, but likely none of them had any first-hand experience of practical Art Nouveau architecture. One of the biggest names that came through from the era was Mikhail Eisenstein‘s, an architect of Swedish and German-Jewish descent and a true citizen of the Russian empire, in the sense that he and his family constantly moved around. In the first place Eisenstein was actually an engineer, but it happened that thanks to his extraordinary social skills – and a fair share of talent – he got the contract to build several apartment buildings for the state counsellor of the city, a certain A. Lebedinsky. Likely his strong friendship with the rich lawyer helped him getting awarded with this contract. Eisenstein’s focus was not so much on the interior of the places: if you look behind the facades and what is inside the buildings he created, you won’t find much in ways of innovation to study there. His full focus was instead on the outside – and there his imagination was flying wild. 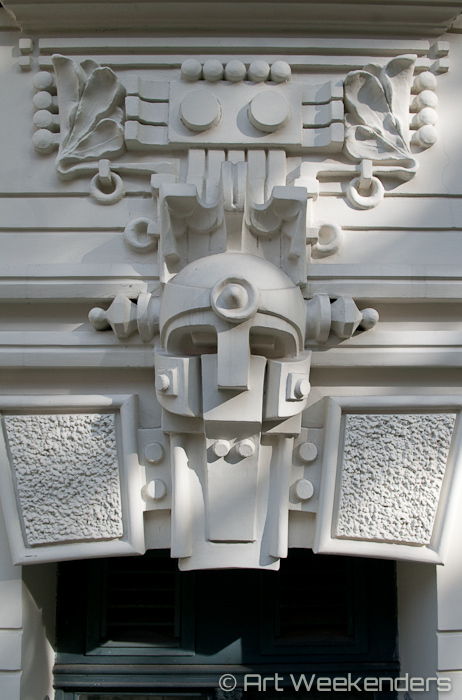 While the Art Nouveau style until reaching Riga was still fairly consistent around its influences – nature, shapes, plants and flowers, colourfulness – suddenly Eisenstein went in a direction nobody else even thought of going before: involving human, mythical and even zoological elements into his design. Being mainly influenced by the Jugend-style branch of Art Nouveau, he extended further on the décor involving the femme fatale theme. 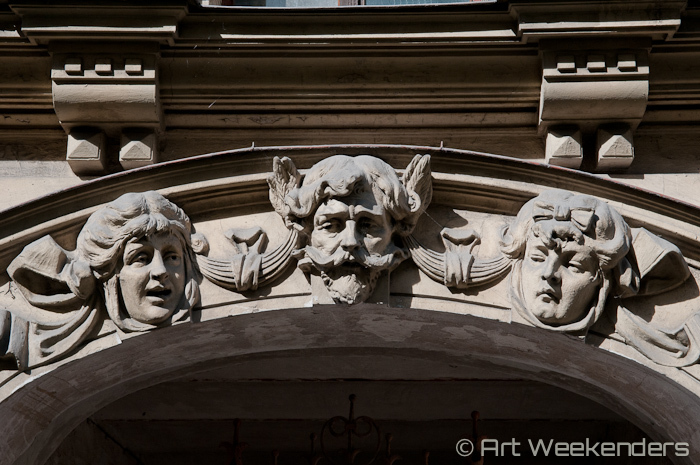 The outcome of it is what we today can find especially on the Alberta Street, the famous spot for Art Nouveau in Riga. It’s never been clarified – as far as we know – if engineer Eisenstein had free hands to do what he pleased or if the design was discussed with the state counsellor himself, the contractor of the project. It is in any case rumoured that a lot of his influences to the motifs were coming from his turbulent marriage. Since he was also deeply interested in opera and literature, it is widely assumed that many of the motifs to his décor were in fact coming from this world. 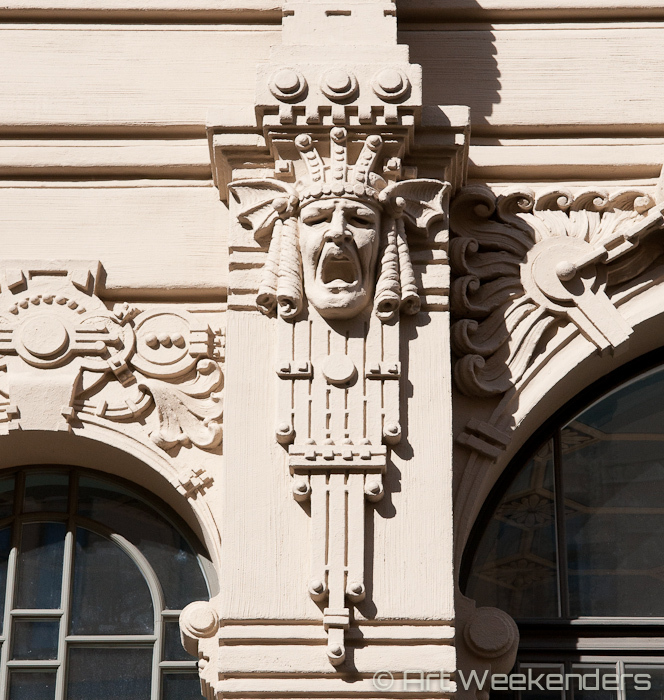 Having a complicated relationship to his wife it is often assumed that the screaming faces found on his buildings are symbols for the unhappy marriage, ways for him to express emotions by making the buildings cry. Much of this is testified to by his only son, Sergey Eisenstein – who later in the 1930s became a not too unfamiliar name, if you know your Soviet film history. Eisenstein turned out to be very productive during the years he was practicing architecture in Riga. During the period of 1897 and 1911 he designed 19 buildings, especially important the spell between 1903 and 1906, which resulted in all the famous buildings on Alberta Street. 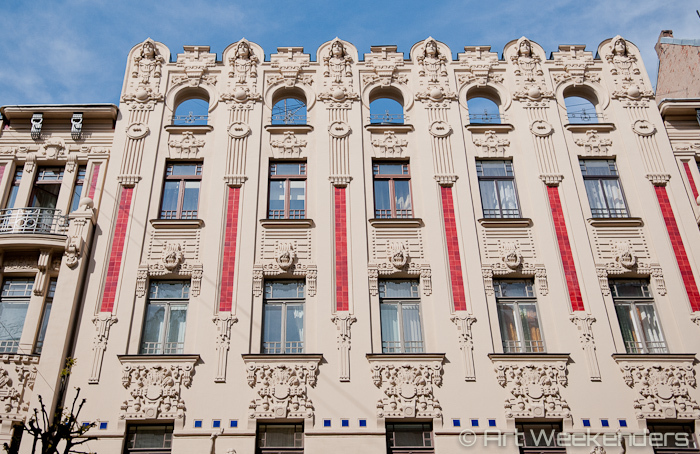 For the ones interested in tracking down the works of Eisenstein’s here are all the edifices where his famous decorative motifs can be studied, the best spot to find Art Nouveau in Riga. What we end up admiring today wasn’t necessarily well-received by the critiques of the time. Both fellow architect colleagues and the press distanced themselves from the eccentric architect, many connoisseurs finding his work too exaggerated, likely kitsch. This hasn’t stopped buyers though, all the properties he build got quickly sold under the strong business sense of his friend the state counsellor, Lebedinsky. 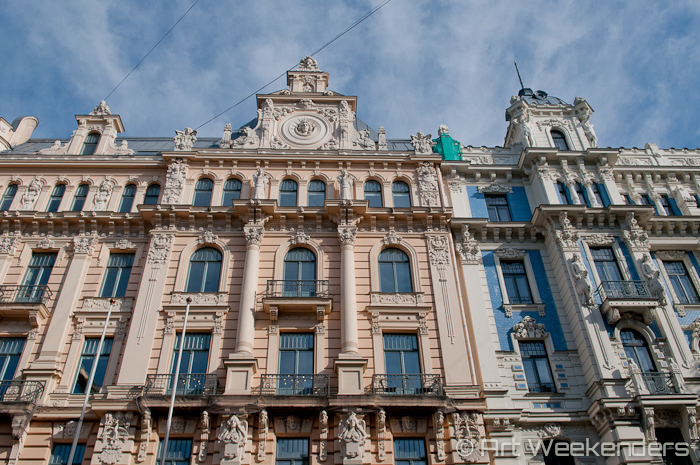 Even today, Alberta Street remains one of the most expensive stretches of real estate in the Baltic region, with square meter prices up to around € 6,000 – if any of the properties would ever be on the market now. Until the very recent past, however, these buildings were all ran down and in bad conditions. After the liberation in the early 1990s it took a while until the priority and finances came on reinstating the former glory of the buildings. It likely also delayed the process that during the Soviet years these buildings were turned into communal houses, each apartment shared by several families, which initially were all inhabited by single families from the upper middle class. With the collapse of communism it took several years until the bureaucratic intricacies ironed out the faith of all the buildings. With all that taken care of, these days they are all shining: once you take the turn into Alberta Street it feels like you ended up in a new world. Eisenstein after divorcing his wife left Riga never to return and never to design any other buildings. The outbreak of the war didn’t help, and being a fierce opponent to the revolution – unlike his film-making son – he ended up emigrating to Berlin, where he also passed away in 1921. 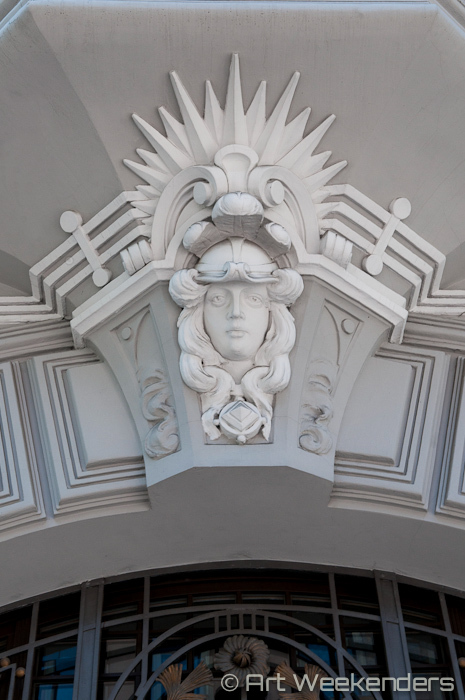 The style applied by Eisenstein and some of his contemporaries for the characterstic Art Nouveau in Riga , with all the decorative faces and animals, is considered as the city’s “Romantic” Art Nouveau style. After the initial flurry, likely also influenced by the criticism it received, the architectural style changed to a more subtle interpretation. 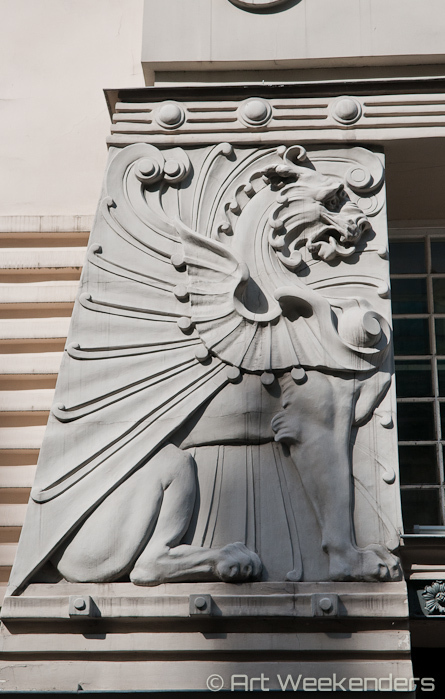 After 1907 the buildings constructed were all in a more ‘mature’ Art Nouveau style with emphasis on vertical lines. Logically enough this style is called “Vertical” Art Nouveau and these buildings can be found everywhere around the city. Since they are less spectacular they attract less attention, but if you pay close attention, you can marvel over their beauty all along the city. 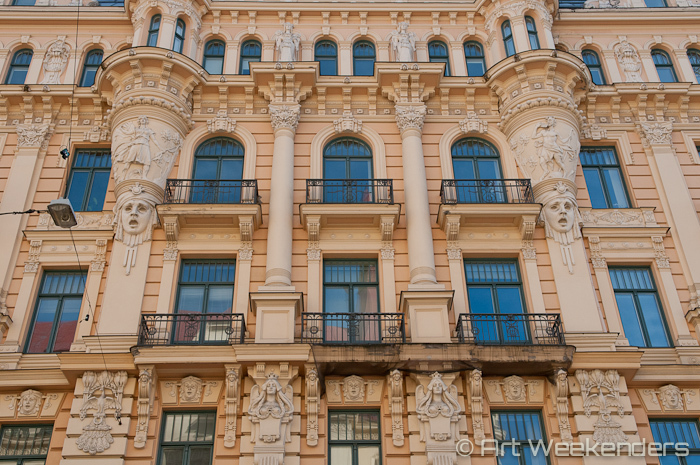 Riga, by the way, isn’t the only place in Latvia famous for its Art Nouveau architecture. 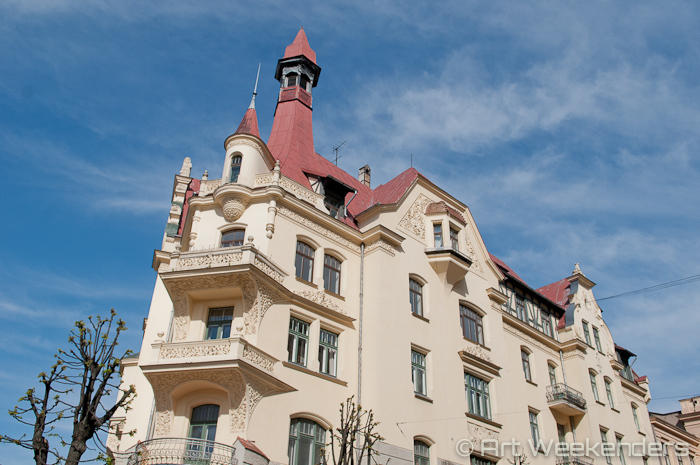 Liepaja on the the Baltic Sea coast is home to hundreds of Art Nouveau buildings as well, and you’ll find a nice selection of prime examples in Jurmala and Daugavpils too. 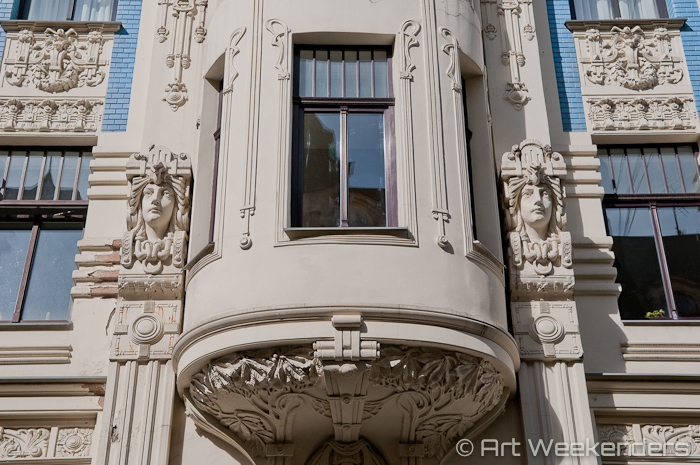 Art Nouveau is much more than architecture. As a style it was covering all aspects of life, from fashion to interior decoration. 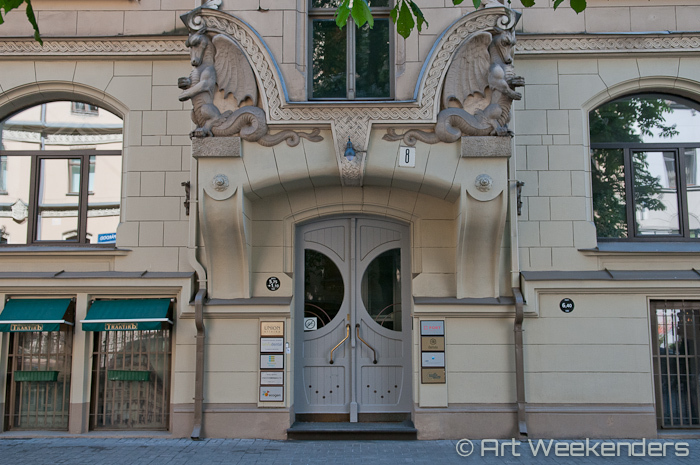 To honour that aspect of it, Riga also has its own Art Nouveau Museum, inside Alberta Street 12: a little world of its own which we’ll be visiting separately in an upcoming article. 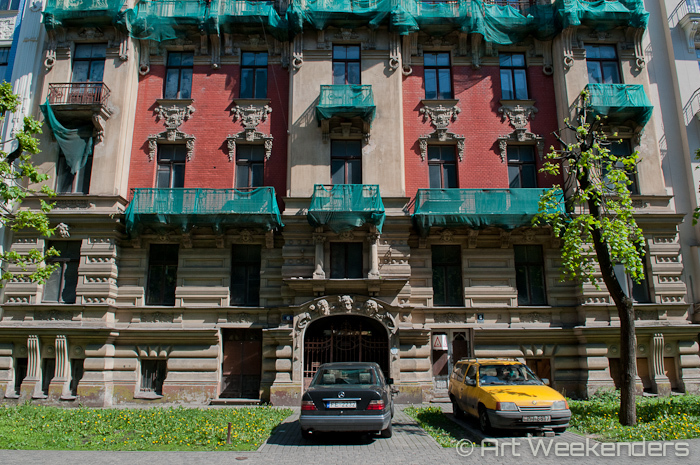 Mikhail Eisenstein’s memory lives on in Riga and the attraction of his buildings is only increasing. The comparison to Barcelona’s Antoni Gaudi might be a bit of a stretch – Eisenstein was more of a thoughtless imitator being influenced by all kind of ideas while Gaudi developed his own unique, never before seen style. But nonethelsss, what he left behind remains very spectacular and much appreciated.